There has not been a more important time in Gaia’s (Earth) history for humanity to learn how to come together. However, as the movement toward Unity picks up more momentum, there are many myths that affect one’s perception of what Unity really means. Many people spout messages of Unity… but only if you agree with their message. That opposition of words and behavior is just one of the ways that we as a humanity can get in our own way when it comes to really digging in and coming together. Our power together is so strong, but the Egoic influences all around us will pull us away from what we can truly accomplish in the name of Unity. Here are 5 of the most common myths that come between us and true Unity. Myth 1: Unity requires everyone to be in agreement. – Unity is not about agreement; it is about mutual respect and acceptance of where another is at in their personal discovery process. Every time you tell another person what they should do, or what they should believe, you are moving away from Unity. You can (of course!) share you beliefs, but also you need to allow for other parties to share their beliefs. Unity is built upon respecting another person as a Soul on a journey (just like you are); even if they have ideas, beliefs, and agendas that clash with your own. Every time you become upset with another person because you do not agree with their words, actions, deeds, beliefs, religious expression, choices, message, etc., you are moving away from Unity. Every time you judge another person to be bad, good, evil, privileged, unworthy, snobby, uneducated, entitled, etc., you are moving away from Unity. Unity does not require that you agree with others, or their choices; but Unity does require that you accept everyone for who they are and where they are in their life. So what if they have a different religion than you? So what if they are a criminal? So what if they are a part of the elite power structure? It is our role to find a way to think of everyone from a place of love, no matter what. This does not mean that you would make those same choices for yourself, or that you pretend they are someone you would want to be friends with. All that means is that you remove yourself from your own emotions of what they did, who they are, or why they upset you, and accept that they are a Soul inside a human body, learning through their choices and actions (just like you are). That is something that each one of us has in common, and in that commonalty is how we can come to a place of love for another. Myth 2: Unity is being a pushover. – Unity is about creating strength through mass consciousness. There is nothing weak about mass consciousness, in fact it is one of the strongest forces in the Universe. It is how we co-create everything from timelines to future outcomes on a mass level. When mass consciousness is influenced, that is how certain outcomes are generated. In order to affect change, you can contribute to this effort by sharing positive words, actions and hopeful visions of the future. The more momentum you build through your effort, affects the future we create. The crumbling power hierarchy understood this very well, and has used mass media to influence mass consciousness for a very long time. We all have the ability to influence the ideas and thoughts of another, because we are all connected. The best thing we can do to ensure our influence is a positive one, is to watch how we speak, what we speak about, and how we say it. Positivity leads to more positivity, whereas anger and outrage lead to more of the same. True strength comes from the power of Love; you multiply that on a mass consciousness scale, and it is truly one of the most powerful forces there is. Unity is not acquiescing to another, it is about building a web on the strength of Love. Myth 3: Unity is an impossible task. – Start small with Unity. Most people cannot even create Unity within their own home. Start by letting go of the judgment of your spouse or family members, and learn to have unconditional acceptance of them for who they are. You do not have to agree with everything they say or do (see Myth 1), but you can certainly learn the fine balance of speaking your truth and opinions, and allow them to share their own. Truth is subjective, as each individual will have their own version of it. Being in disagreement over details, is how the first cracks in the Unity web begin. Unity is about agreeing to disagree, to accept that another person’s version of the truth, is the truth of what they experienced. It does not have to match your truth, for it to be true from another’s perspective. Even a dispute over loading the dishwasher can be a chance for you to practice Unity. It is in how you say what you say, and the energy behind the intention of it. Practice having a day of Unity in your home once a week. You will be surprised at how your own thoughts, reactions and energy begins to shift from this one day. If everyone in the world practiced Unity on the same day, we could change the course of history in that very moment. In fact, I will suggest right now that we make Thursdays the day to practice shifting the planet toward Unity. This way we can build up momentum toward Unity each week, and eventually each day. How are you going to be ready for the next Unity Shift Thursday? Myth 4: Unity requires equal effort. – This becomes a point of anger for many people, because as an individual we judge how much effort we are putting forth into a task or aim, and expect that others will also do the same as we are doing. However, this practice of monitoring the efforts of ourselves, and comparing our efforts to the efforts others, is not Unity based. Remember, Unity is the acceptance of others for where they are in their life right now. Acceptance is respecting that their health might prevent them from devoting as much time into something as you, or that their talents lie in different areas. There are many reasons why one person may not be able to devote as much time, energy or effort to a cause as you. Unity is about accepting that each soul is different, and thus has different ways of showing their devotion to what they believe in. Getting upset because someone is not doing “enough” is a judgment, and judgment does not contribute to Unity. Myth 5: Unity is more important than individuality. – Unity and individuality are equal, one is not better than another. In fact, they are really parts of the same whole. Unity is about combining everyone’s skills, expertise, viewpoints, experience, and wisdom into a new Wholeness that comprises an amalgamation of everything. That Wholeness needs each individual to be themselves, otherwise Wholeness cannot exist. You cannot contain 100% of anything, if you are missing any one part of it. Unity is inclusion of all. We cannot develop Unity without also simultaneously focusing on who we each are as individuals. So, what can you do? Reflect on these common myths, and develop ways for you to become an agent of positive influence for Unity. 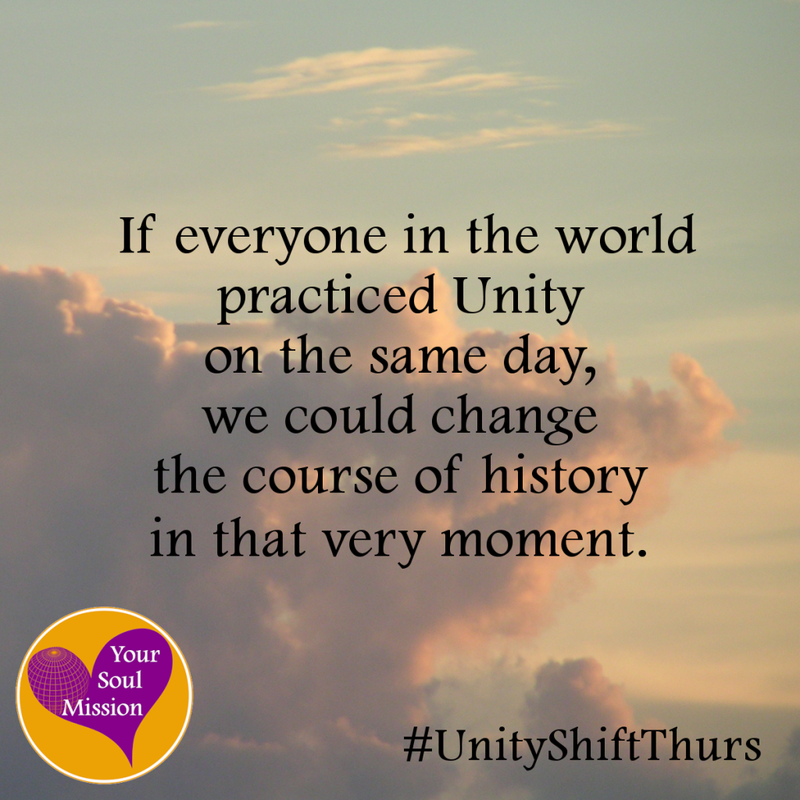 Make the effort and intention to participate in Unity Shift Thursdays, in your own home and beyond. Roll the momentum you create into practicing Unity each and every day. Spread the word. We are so strong together!